As an expert at applying stickers to my vehicle I have also become accustomed to taking them off. So after I got my two thousandth email asking "how do I remove stickers from my car?" I thought I should make a general reply here. Because how are you supposed to put all these awesome stickers on your car if you can't get the old ones off?! Alright, so you either bought an old car with a bunch of crappy stickers you don't want or you're tired of the stickers you have and want to remove and replace them. The first thing you have to do is peel off the bulk of the sticker. This ain't carpet science (you know... the science of... carpets.) so just grab a corner or a loose looking edge and peel. Think opposite of band-aid here. The slower and more carefully you peel the easier the sticker should come off. When you get off as much as you can by pulling you're going to need the help of the most amazing solution in the world. 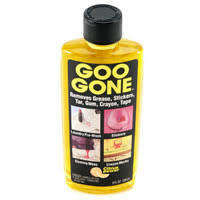 Yes ladies and gentlemen, I am referring to GOO GONE! You can buy this wonderful sauce at any home depot and it's relatively inexpensive. Not only will it take off your old stickers but it will remove almost any stain any where. So, "what do I do with this 'Goo Gone'?" you ask? Well, remove the cap and give the sticker remnants a good blast with the stuff until the sticker is fully saturated. Now, wait about 5 minutes and give the sticker another blast. Now with an old rag and some elbow grease rub that sticker until it's nothing more than a damp heap of goo on the asphalt. Congrats your stickers are gone! Now go buy some Window Stickers!